Enrico Pallazzo, an acclaimed Italian opera singer who achieved greater international fame by thwarting an assassination attempt on the queen of England while working as a baseball umpire, died Sunday. He was 84. Pallazzo died from health complications at a hospital, a large building with patients, near his home. 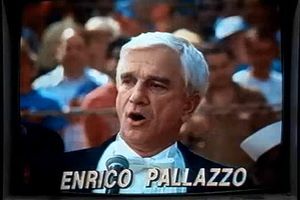 Paramount Pictures A true Renaissance man, Enrico Pallazzo umpired the game after performing the national anthem. In 1988, Pallazzo was invited to sing the national anthem before a baseball game between the California Angels and Seattle Mariners that was attended by Queen Elizabeth II. After the game's seventh inning, Angels outfielder Reggie Jackson attempted to assassinate the queen while under the influence of hypnotic suggestion. Jackson was thwarted by Pallazzo, who fired a tranquilizer dart from his cuff link that struck an obese woman in the stands. The woman fell on Jackson, knocking him out of commission and prompting jubilant spectators to chant Pallazzo's name. Pallazzo subsequently proposed to his girlfriend, Jane, who instead of shooting him said yes. Arab-Israeli peace talks resumed shortly thereafter. After delivering an avant-garde rendition of the anthem, Pallazzo umpired the game. Calling balls and strikes from behind home plate, his style was flamboyant, characterized by sidestepping, pirouetting, bowing to the crowd and a Michael Jackson-inspired moonwalk. Players recalled Pallazzo as being unusually hands-on in his approach, liberal in his stance on illegal ball doctoring and possessed of an uncanny ability to determine strikes before pitched balls reached home plate, a trait that contributed to his inimitably eccentric strike zone. Pallazzo was the first -- and only -- umpire to eject another umpire from a major league game. He also is believed to be the first -- and only -- umpire to use an upright vacuum cleaner to tidy up home plate. Born Dutch-Irish to a Welsh father, Pallazzo began his career as a locksmith and later practiced medicine. After discovering that Soviet leader Mikhail Gorbachev's famed birthmark was actually a wine stain, Pallazzo declined the offer of a Cabinet position by President George H.W. Bush. Pallazzo is remembered by friends for his appreciation of stuffed beavers and his desire to find good, clean love without utensils. Pallazzo was romantically snake-bitten: One early relationship ended with a tragic blimp accident, another because of his girlfriend's musical career -- she spent 300 days a year on the road with the Chicago Male Chorus and Symphony despite not being able to carry a tune; when Pallazzo bought her a harp as a gift, she asked what it was. Pallazzo's relationship with Jane, by contrast, brought him happiness and led him to notice things he previously had ignored, including birds singing and stoplights. Disappointed that he was unable to fulfill his lifelong ambition to die by a parachute not opening or by getting caught in the gears of a combine, Pallazzo told friends and family gathered by his deathbed to "win one for the Zipper," adding that he did not know where death would take him but that it wouldn't smell good. When a relative said that Pallazzo surely couldn't be serious, Pallazzo replied that he was and requested that he not be called Shirley. Offered a last meal of steak or chicken, Pallazzo chose lasagna.